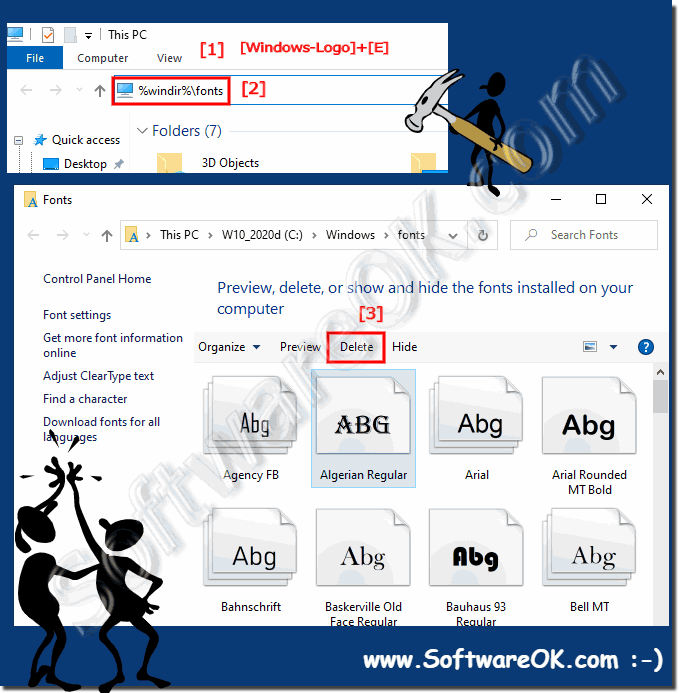 The solution is simple to uninstall fonts from Windows-10 (remove, delete)? 1. Please use Windows+R keyboard shortcut, to start the Windows-10 Run Dialog! 3. In the MS-Explorer click / select one or more Fonts and the Button Delete to uninstall the selected fonts in Windows-10. Despite the abundance of preinstalled fonts in Windows 10, users, especially those involved in design, graphics, advertising, and printing, often require the installation of additional fonts, for example, imported from third-party applications or created for business purposes. Installing Fonts what could be easier! However, some users of Windows 10 even sometimes need help resolving such an elemental task that provides information from the article. ► Copy a font ergo install from another folder on Windows-10! Many Windows 10 users, for one reason or another, add additional fonts to their operating system. Sometimes it is necessary to create a document with a specific font, or when processing photos. But after the actions performed, the new fonts disappear or are not uninstalled correctly by programs. Which also means that it will simply garbage the operating system. Here's the solution for how to completely remove fonts in Windows 10 so they are uninstalled and do not unnecessarily burden the computer.